Roy H. Riechmann, 84, of Valmeyer, died Nov. 13, 2013, in Red Bud. He was born Sept. 29, 1929, in Merrimac, son of the late George and Louise Riechmann (nee Kruse). He was married to Alberta T. Riechmann (nee Jatho); she survives him. Mr. Riechmann was a member of St. Mary’s Catholic Church, Valmeyer American Legion Post 901, and Valmeyer Knights of Columbus. 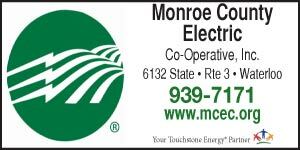 He was the secretary of Monroe Service Co. for many years and was a member of the Monroe County Farm Bureau. Survivors include his wife; children Perry (JoAnn) Riechmann, Eric (Susan) Riechmann, and Alex (Teena) Riechmann; grandchildren Bradley (Megan) Riechmann, David (Haley) Riechmann, Sam Riechmann, Karla Riechmann and Clara Riechmann; and great-grandchildren Eliot Riechmann and Miles Riechmann; along with sisters-in-law, brothers-in-law, nieces, nephews and cousins. In addition to his parents he was preceded in death by his three brothers, Oliver, Elmer and Howard Riechmann. Visitation was Nov. 15-16, at Quernheim Funeral Home, Waterloo. A funeral Mass was celebrated Nov. 16, at St. Mary’s Catholic Church, Valmeyer, Father Urban Osuji officiating. Interment followed at St. John Cemetery, Valmeyer. Memorials may be made to St. Mary’s Building Fund or in the form of Masses.